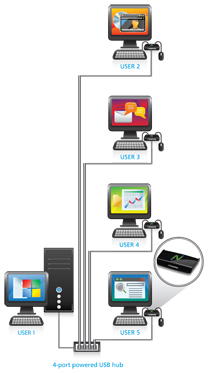 NComputing virtual desktops share the excess power of standard PCs and make computing simple and affordable. You save money by sharing the cost of a single PC among multiple users. And your users feel like they each have their own PC while they simultaneously share common applications—including web browsers, e-mail, office suites, and multimedia. Every user has their own keyboard, screen, settings, applications, and data files, so their experience is just like it would be if they were working at an independent PC. NComputing vSpace desktop virtualization software creates an independent workspace for each user on a shared computer. Each workspace is a virtual desktop that looks and feels just like it would on a standalone PC. 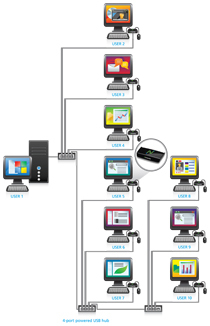 Users interact with their virtual desktop through their U170 access device, which connects directly to the PC through a USB cable or optional USB hubs. A USB virtual desktop kit includes vSpace virtualization software, a U170 access device, and a 1.8 meter USB cable. Install the vSpace software, connect your keyboard, mouse and monitor to the U170, plug the U170 into the PC and you are all set. If you need USB peripherals, simply connect them to a hub downstream from the U170. Our software will automatically assign each device to an individual user. Want your desk space back? The compact U170 mounts directly to the back of VESA-compliant monitors. If you have users more than 10 meters away from the shared computer, choose the L-series instead. If you need the absolute lowest cost per user, choose the X-series.